Astronomers in the U.K. have come up with a new web-based game that they hope will help them determine how galaxies actually merged. Galaxy Zoo 2 shows players an image of a real galaxy and then asks them to match it to one of eight other images created by a simulation, with the intent of determining which simulations produce the most accurate results. The astronomers are enlisting the aid of the general public because people are "much better than computers" at spotting patterns and similarities in the images and by employing them in large numbers, they're more likely to get an accurate result. "The strength of the game is that it takes results from many people," said Dr Chris Lintott of Oxford University and a member of the Galaxy Zoo team. 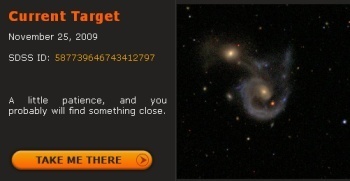 The game is actually a followup to an earlier Galaxy Zoo project which launched in 2007, asking members of the public to help find and identify different types of galaxies in a series of images. Lintott said that effort was a "victim of its own success" as participants came up with 3000 "fantastic images" of merging galaxies, far more than the project could ever simulate on its own. As a result, Galaxy Zoo has developed this new game so the public can help sift through those images in greater detail. Determining which simulations of galactic collisions produce the most accurate results is important to unlocking the secrets of the universe because the events themselves take far too long to observe directly. "These collisions take millions of years to unfold," said team member Anthony Holinchek, a graduate student at George Mason University. "All we get from the universe is a single snapshot of each one. [With] simulations, we will be able to watch each cosmic car crash unfold in the computer." This isn't the first time that astronomers have used games to put the public to work on their behalf; NASA recently unveiled a similar game of its own in which people can help the space agency create a detailed and accurate map of the surface of Mars. Using the power of games to put the public to work on massive, time-intensive projects like these is a fantastic idea and if they succeed (which, based on Lintott's comments, sounds very likely) it could potentially herald a whole new era of distributed, participatory research. Want to help out? Go do your bit for science at galaxyzoo.org.